It was a good plan, but…. 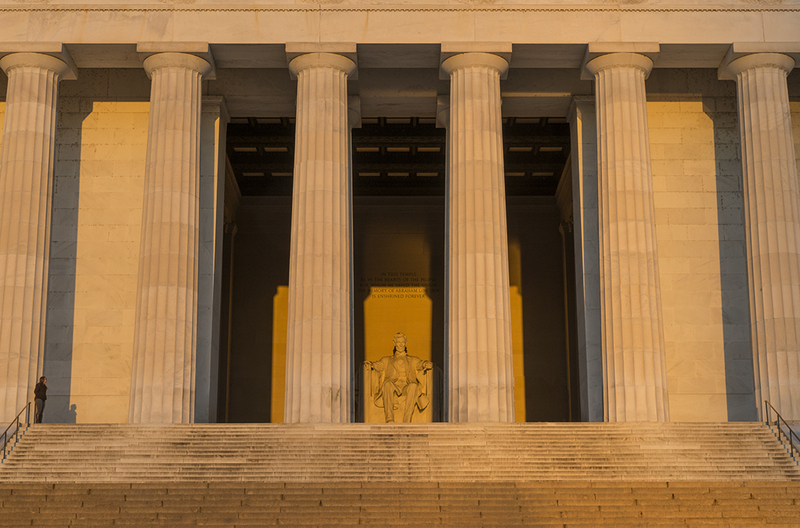 Those who read my post of 9 March already know that this is the time of year to capture a perfect solar alignment with the Lincoln Memorial in Washington, DC. 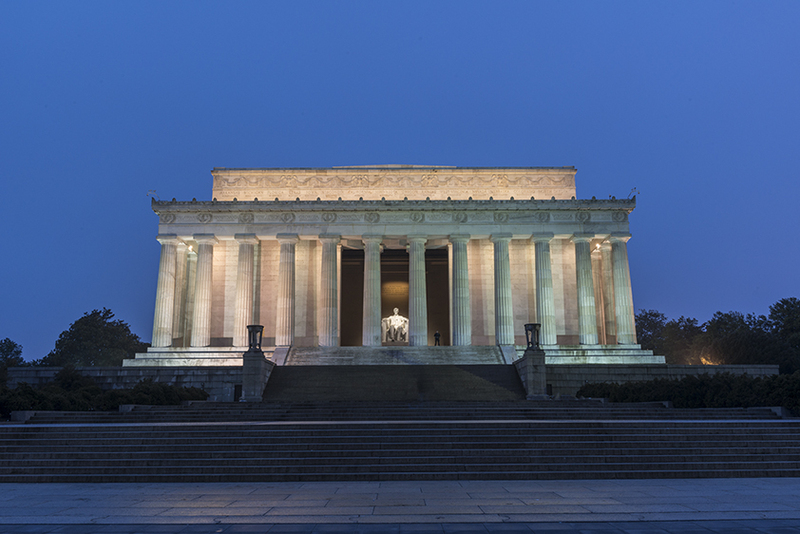 And so for the past five days I have been showing up n front of the Memorial about 30 minutes before sunrise. What follows is a tale of following two guiding principles: making lemonade and being persistent. The forecast for 20 March, the actual day of the vernal equinox, was for clear skies, exactly the conditions required for the image I was after. 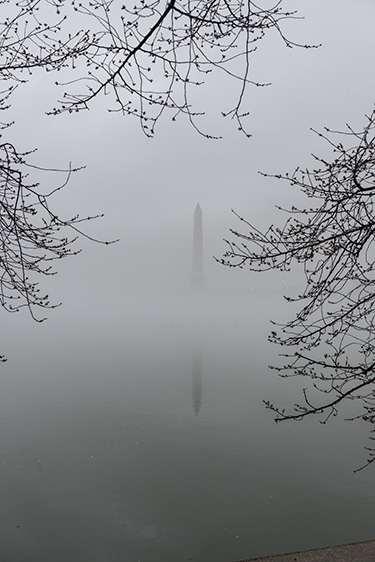 But I awoke at 5:30 AM to find a dense fog so thick you couldn’t see half of the Washington Monument. and it was obvious that my chances were slim. So I set about making lemonade. I’ve learned you often can get the twilight blue color (see my post about Magic Hour) with cloudy weather just as you can with clear skies. 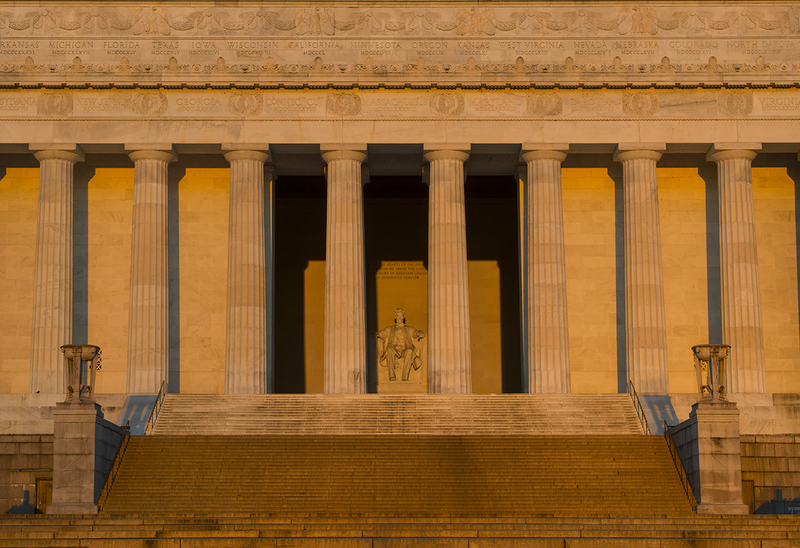 The lighting system of the Lincoln Memorial is very well balanced for this time of day. The artificial lamps enhance the architectural features of the building and there is just enough ambient light 20 minutes before sunrise to provide detail in the unlit surroundings. For about 3-4 minutes, the Memorial looks like a shining jewel box set against a brilliant blue background. The above image was shot at 6:48 AM about 24 minutes before sunrise. otherwise ordinary image. 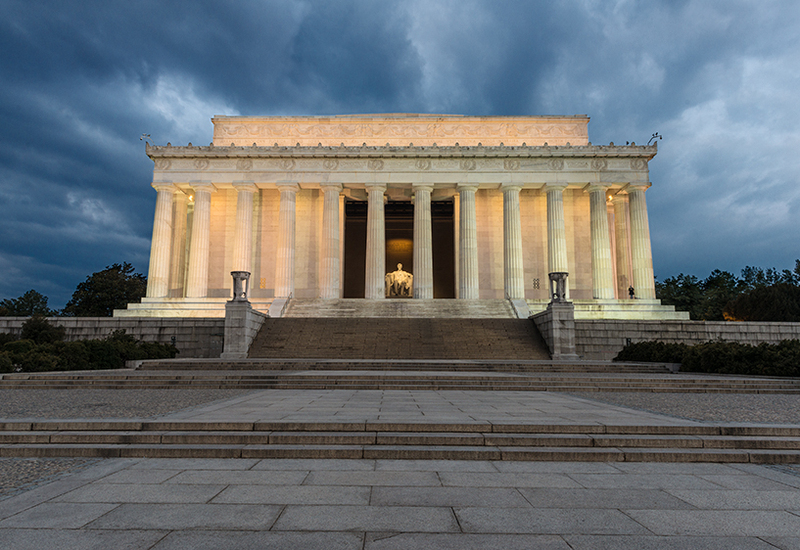 So I waited a little longer than I had the previous day in order to get greater detail on the clouds but still retain the special quality of the lighting system working its magic on the exterior and interior of the Memorial. The above image was photographed at 6:55 AM, about 17 minutes before sunrise. I should add that aside from weather problems, each day featured an interesting cast of characters that affected my opportunities for shooting. 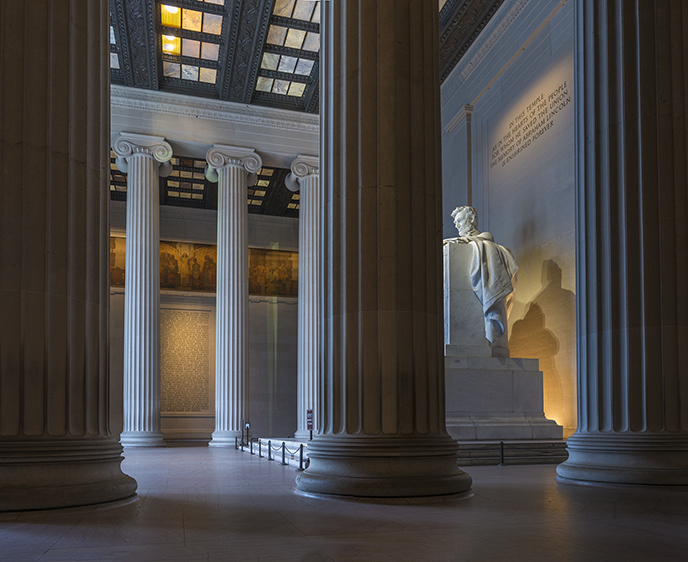 It surprises most people to learn that the Lincoln Memorial is a very popular place in the early morning. Most common is the exercise crowd. The two most impressive in this group were the squad of soldiers in full camouflage and full equipment packs doing laps around the Reflection Pool and a trio of very fit young women who ran up and down the steps of the Memorial for about an hour with only occasional breaks for some stretching exercises. the dedication text above the statue, and the complete Gettysburg speech on the south wall in the background. It may be hard to read in this version but when it is fully enlarged to about 30” X 36” the engraved writing is easy to read. (Technical note: this image is actually 4 separate images merged together into a single image, taken at 7:18 AM, about 7 minutes after sunrise.) I think this is the best batch of lemonade of the week. Having already disproved the old adage that the “Third Time is the Charm” I ventured out again on Sunday morning, encouraged by the small break in the clouds to the east. 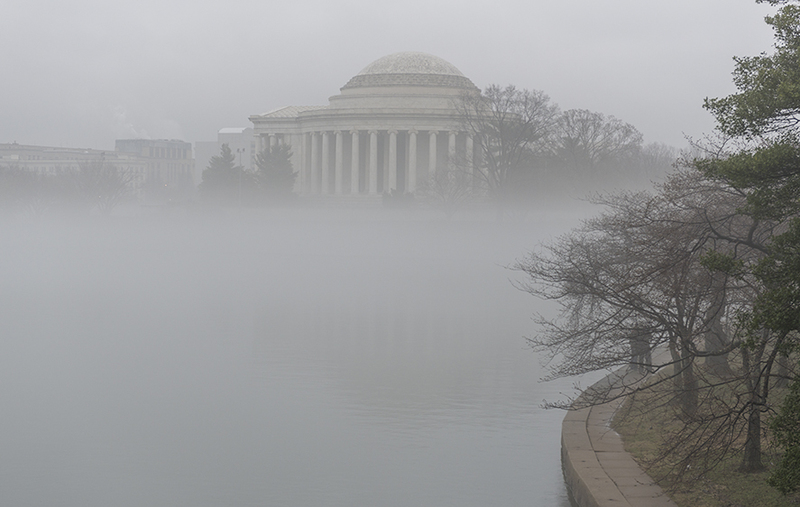 But it was more likely that the best angle this day would be to point the camera toward the Washington Monument. A mix of clouds and open sky in the east can often bring spectacular sunrises and I thought I would try a different angle, suggested by a fellow photographer on the first day. If we insist on sticking with the lemonade analogy, the above image is probably Grade B, but the drawbacks (scaffolding on the Washington Monument, an near-empty Reflection Pool, and a construction crane over the new Museum of African American History) do provide some contextual interest. So, this morning (March 24) was Day number 5 and if you have read this far, you are probably praying for a happy ending (or any kind of ending). The forecast called for a sharp drop in temperature, some wind (ugh!) and clear skies. And they were spot on. The sequence of pictures below show what happened over a 5-minute period. So it would appear that both pieces of advice were correct. When conditions didn’t favor the plan, I was able to capture some images I would otherwise not have gotten. And by the fact that I kept showing up, I also got the image I was after. 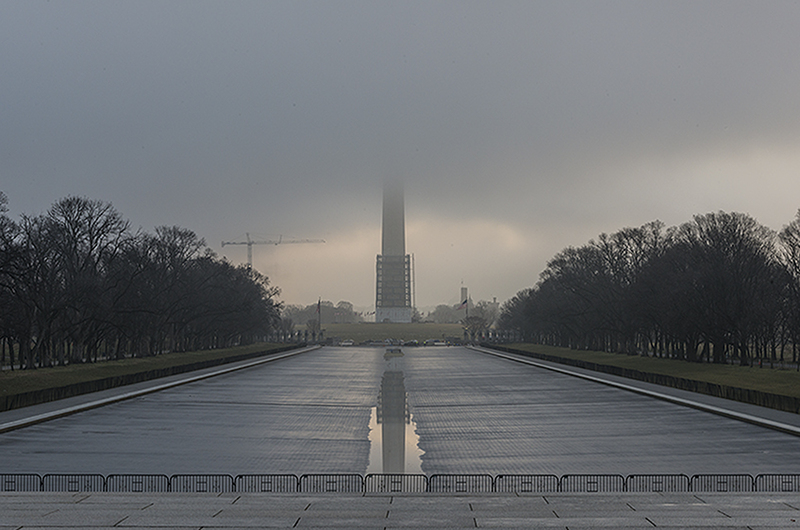 looking west at 7:10:38 AM Sun is partially visible just to north of Washington Monument which is behind the camera. 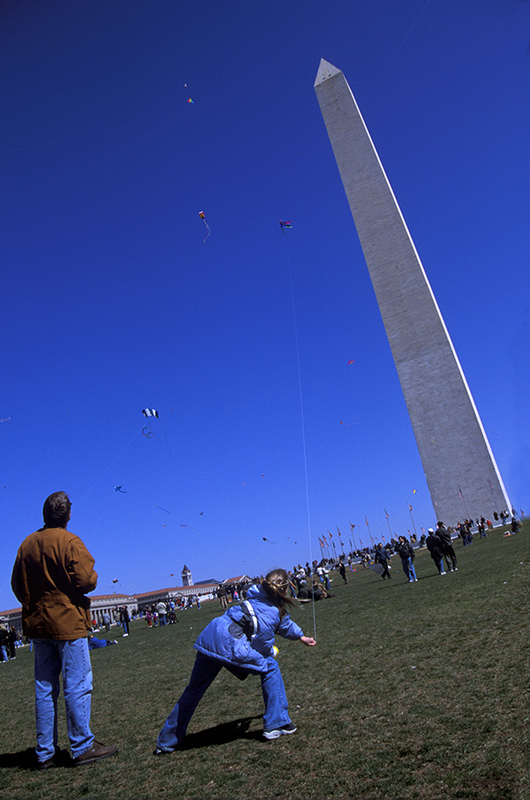 If you love kites or better yet photographing them while others fly them for you, mark your calendars for Saturday, March 29th when the Washington Kite festival will be held on the grounds of the Washington Monument. The best part? It’s free. 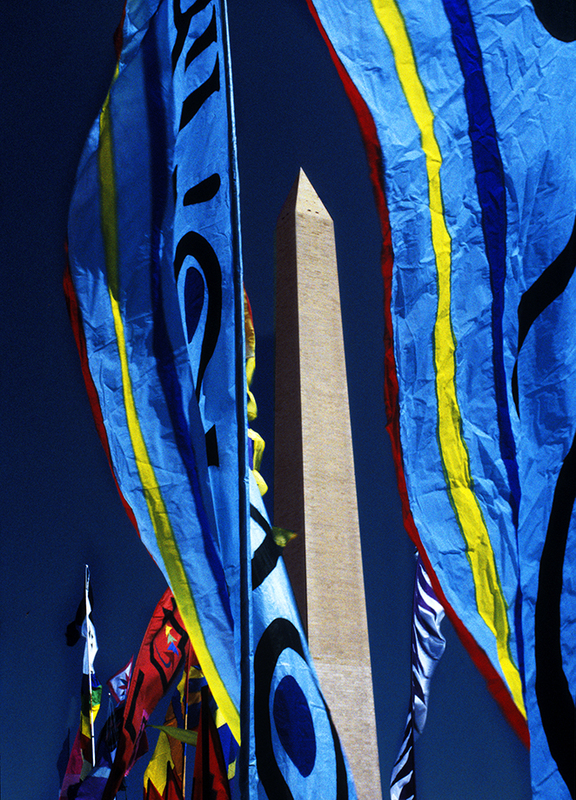 The Festival was started in 1967 by Paul Garber, also founder of the National Air and Space Museum. 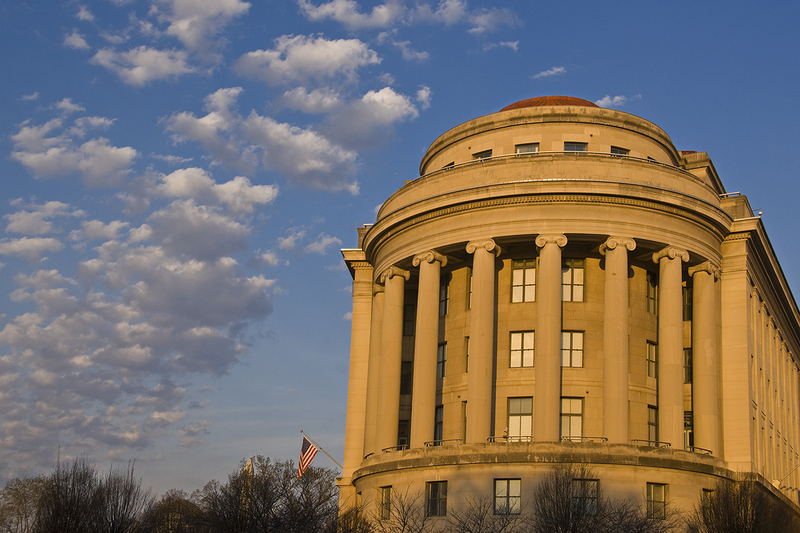 It was managed until 2010 by the Smithsonian Associates, a division of the Smithsonian Institution. 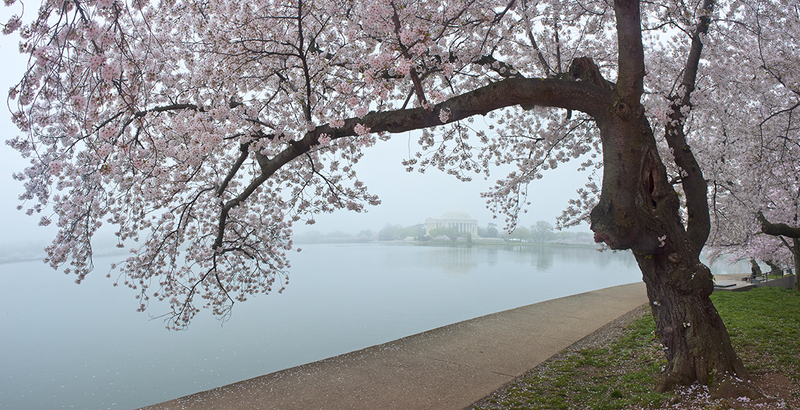 After 44 years, the event was transferred to the Cherry Blossom Festival and was renamed the “Blossom Kite Festival.” Information about the Kite Festival can be found at their website. 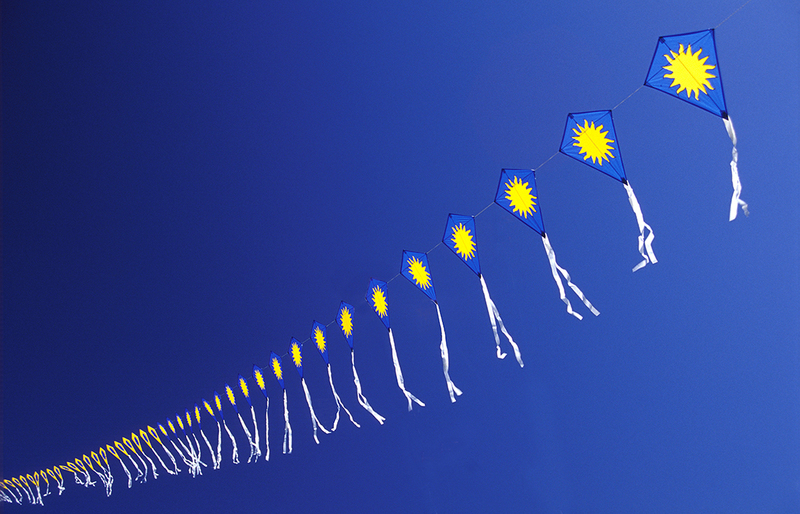 Now that the Cherry Blossom Festival has taken over, there is a shift from the aviation theme that characterized the Smithsonian years to the Japanese connection because the original cherry trees were a gift from Japan in 1912 Kites first appeared in Japan in the 7th century but they originated in China more than 800 years before that. 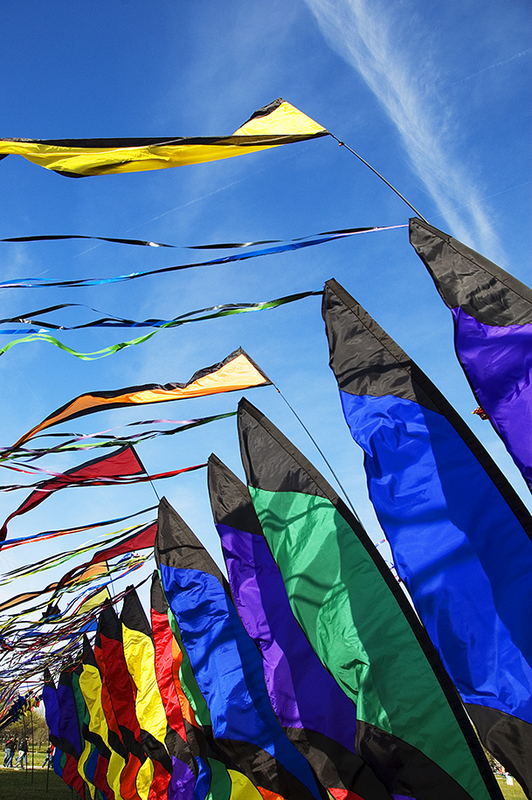 For a photographer, the best conditions for this event are a crisp blue sky and a good wind. So the pictures you see here were taken in those conditions. During the mid-morning hours (10:00-11:00 AM), a circular polarizer can really make the colors pop and bring a little extra drama to a clear blue sky. 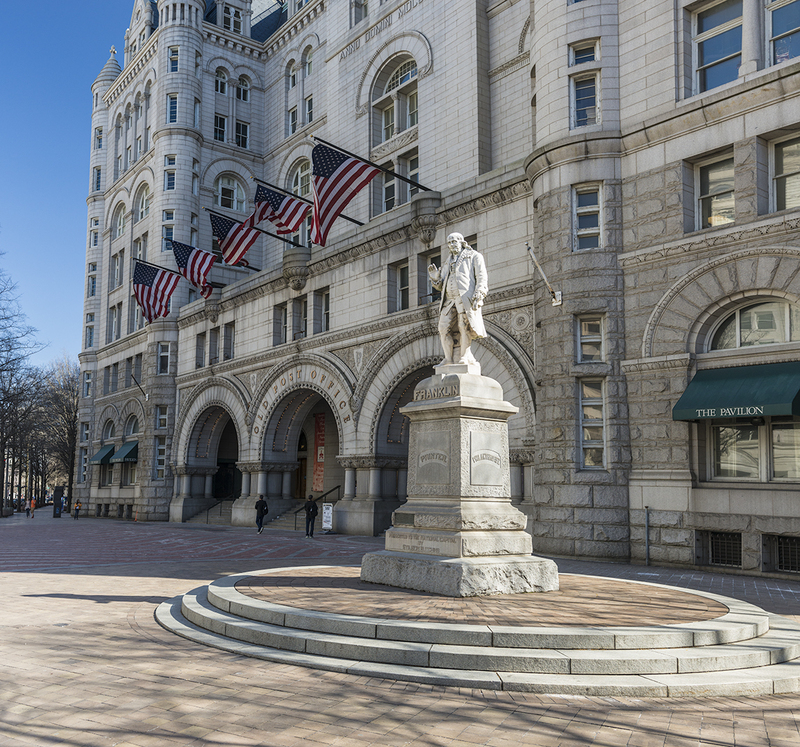 The Old Post Office is a unique building with a long-running history of many narrow escapes from the wrecking ball of progress. So it seemed like she deserved one last visit before she began her new life. As I approached the front entrance, nothing seemed amiss. Tourists, looking for a way in, pulled fruitlessly on locked doors, confused by signs claiming that the observation tower was open and mystified by the wrongly aligned directional arrows. But I knew her secret; a below-grade doorway on the east side. This was where the security guard inspection station had been located when federal agencies occupied the building just a few short months ago. Back then, everyone had to undergo a TSA-level check, even if they only wanted to buy a soft drink. But now the x-ray scanner was turned off. A single guard, relaxing on a chair, waved me through without a second glance at my large black backpack. 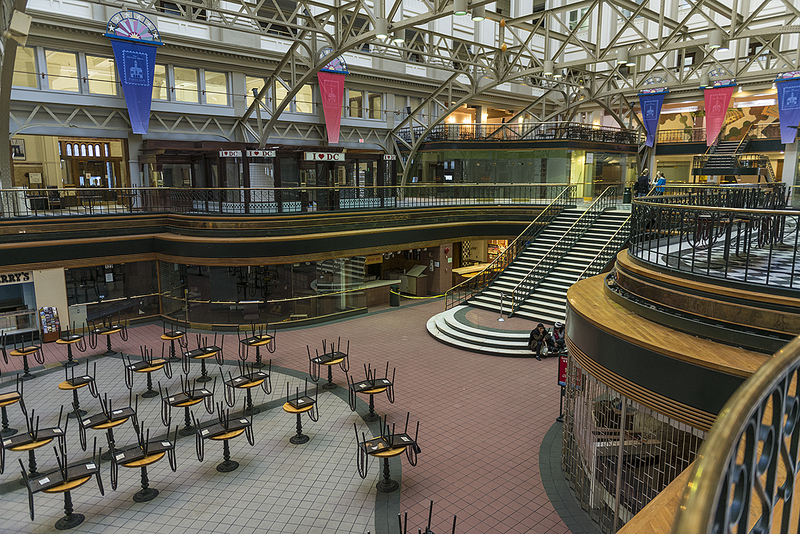 I walked into the atrium, a 10-story open space that was almost completely deserted. All of the fast-food establishments and souvenir stores that had been there for years were now gone, their doors and windows shuttered, A single custodian was sweeping the floor of the food court, each of the forlorn tables topped by one or two upside-down chairs, symbolic of a closed restaurant. Peering up toward the glass-covered roof, it was obvious that all of the federal employees who used to work in the upper level offices were gone. A few persistent tourists who had found their way inside ambled toward the small space housing the National Park office where a ranger welcomed them. I followed and he pointed us to the elevator to the observation tower where a spectacular 360-degree view of the city awaited. 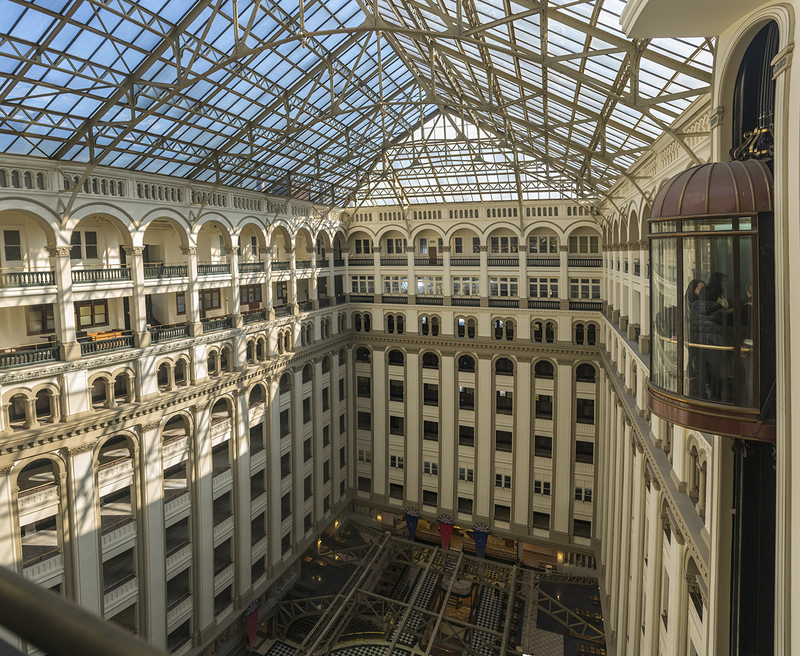 The elevator, with a curved glass rear wall, carried us to the 9th floor and we could see the entire atrium as we ascended. We disembarked and followed the signs to the small elevator to the 13th level. As we waited for the second lift to appear, we looked at the set of thick bell ropes, which are used by the bell ringers to peal the set of bells hung on the 10th level. I recalled an evening, years ago, in the observation tower while the bells were being rung. I could feel the entire tower move gently in response to the movement of the enormous bells. There was nervous laughter from the tourists as the second elevator shuddered and groaned from the effort to take us up. It was as if it knew it was nearing the end of its life. Then, after what seemed like a malicious pause, the doors rumbled open and we were struck by the brilliant light of a sunny day and a blast of chilly air. Even when you know that the tower is open to the elements, it is always a surprise to emerge from the cocoon of the elevator and be slapped by the outdoor reality of wind and cold. Here, nothing seemed to have changed. The tourists checked out the views as they moved slowly from one vantage point to the next. The openings are protected by an acrylic sheet or closely-spaced vertical wires. The latter make the space essentially open to the elements and the lack of protection from reality is what makes this place special. The vertical strands prevent birds from flying in or anyone from leaping out, but wind, rain, snow, or whatever element Mother Nature has in mind that day become part of the experience. It was sunny and mild —in the low 60s—but it was windy. For me, as the wind whistled through the cables, it was a perfect day for a farewell. As always, the Park Ranger on duty was friendly and informative. At present, the plan is to close the tower in April, the exact day not yet official. 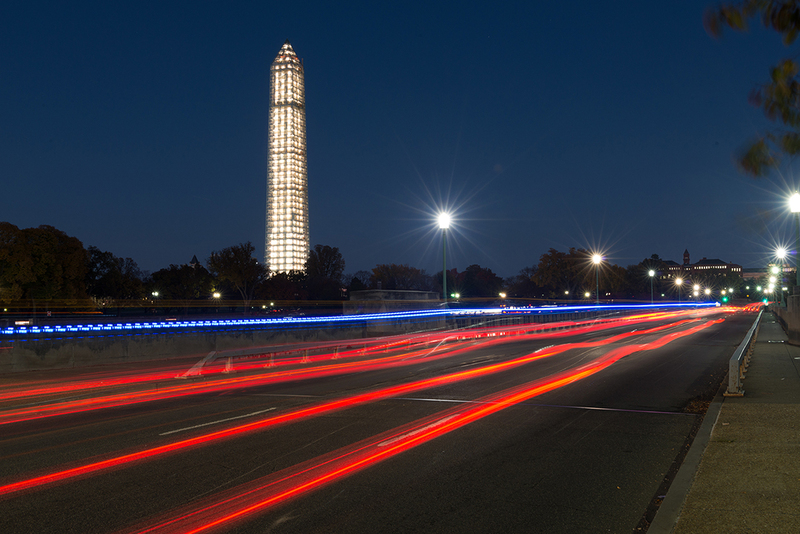 At about the same time, the Washington Monument will reopen after a lengthy repair project made necessary by the earthquake on August 23, 2011. Again, no official date has been set but I’m looking forward to a visit there in the near future. *Technical footnote: There is a trick to shooting through wires, so don’t believe the folks on Trip Advisor saying it is impossible. No Photoshop trickery is needed. The technique works best with a telephoto lens, but this was done at 70mm. Use the widest aperture available on your lens, in this case I set it for f/2.8. Then focus on a point in the distance. Bring the lens as close as possible to the wires, touching them gently if possible. If all works as it should, the wires will be so out of focus they will disappear. I sometimes think of the planet earth as a spaceship carrying its passengers through the universe or, more accurately, in an orbit around a star we call the sun. In less than two weeks, our earth will reach a significant moment in its orbit, known to those of us in the northern hemisphere as the vernal equinox. In non-technical terms, this is the time when the two bodies are perfectly aligned, essentially face-to face. Neither northern nor southern hemispheres are tilted away from the sun and the day is the same length as the night. This year, that moment will occur at 12:57 EDT on March 20. 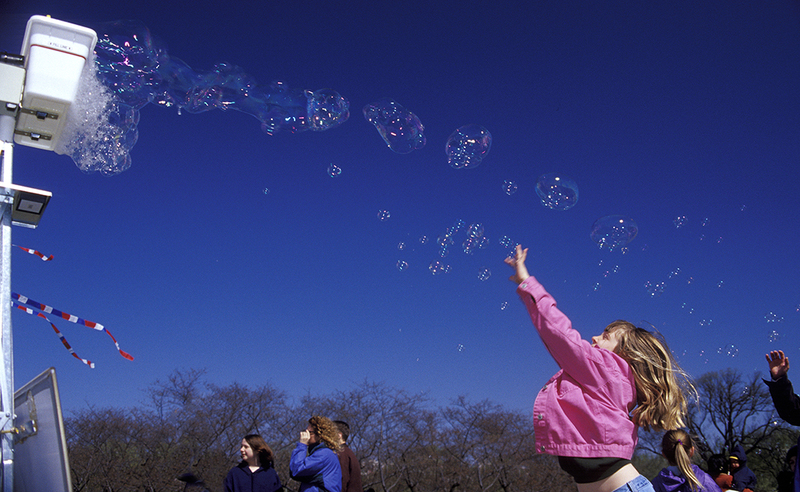 Over the millennia the spring equinox has been celebrated in many cultures as a symbol of rebirth and regeneration. 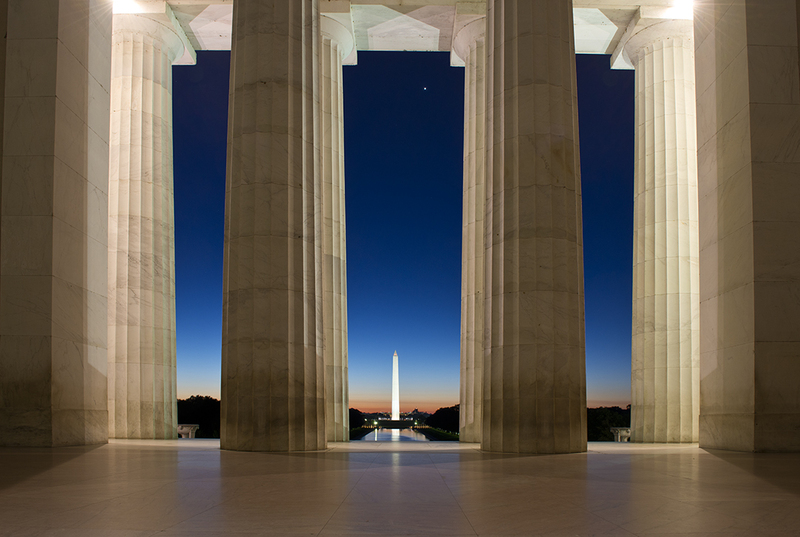 As a photographer in Washington, DC it symbolizes the phenomenon of solar alignment. This is the time of year when the relationship of the sun to the architectural plan of the city becomes really interesting. On the day of the equinox, the sun will rise at due east on the compass. The city’s layout, based on Pierre l’Enfant’s original plan, put the Mall on an east-west axis. 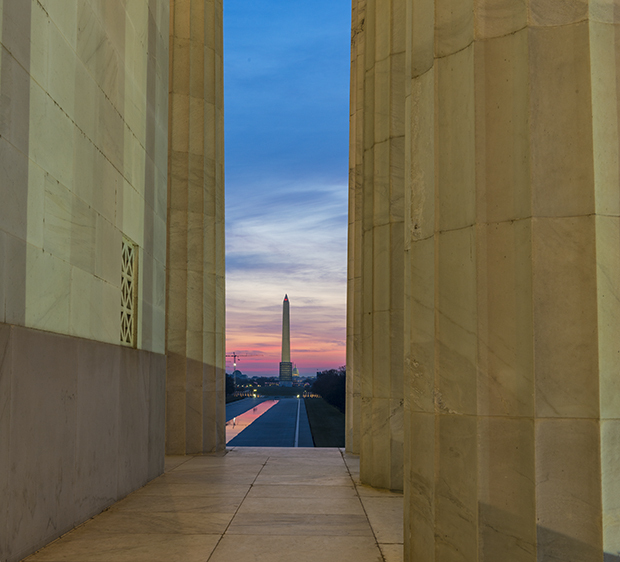 For example, a line drawn due west from the center of the US Capitol Building will pass through the center of the Washington Monument and the center of the Lincoln Memorial. Why is that important to photographers? Because that is the only time of year that an image like the one above is possible. Most photographers know that the golden light of a perfect sunrise lasts for only a few minutes after the sun clears the horizon. 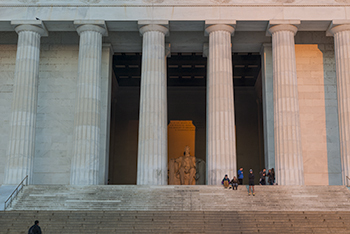 But on almost every day of the year, the sun rises at an angle that will cast a shadow across the statue of Lincoln inside the monument—a shadow caused by the columns in front of the statue. 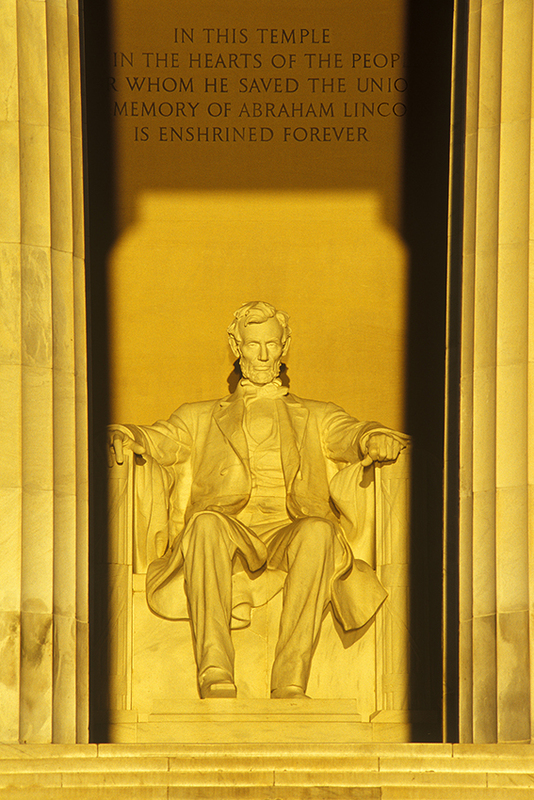 But on a few days around the equinox, the sun during those golden moments is located at due east or close enough to it, that the light passes directly into the interior and perfectly illuminates the statue. 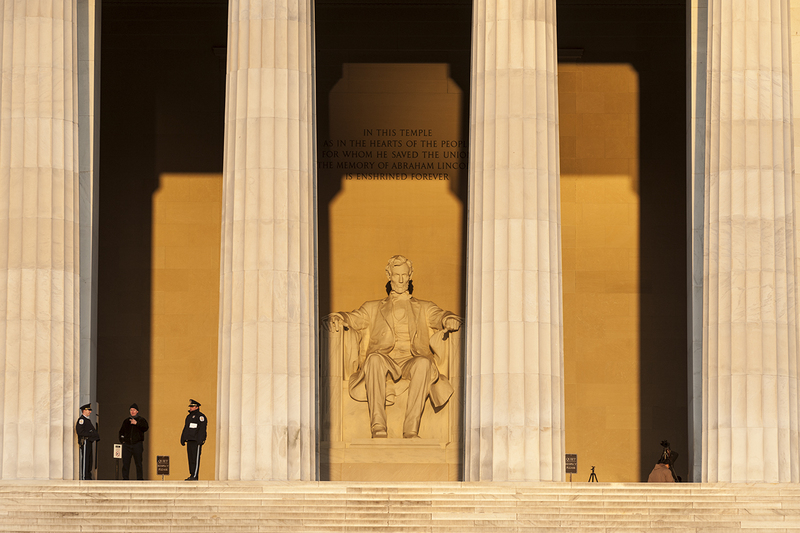 If conditions are perfect at the critical time, and it is rare that they are, you will have about 20 seconds to catch the statue with the shadows just brushing the left and right edges of chair on which Lincoln is seated. In the photographs above, you’ll see that the shadows are not quite perfectly aligned. That is because one or more people were obstructing the view of the statue. Nevertheless, I had better luck a few days before the fall equinox of 2001. 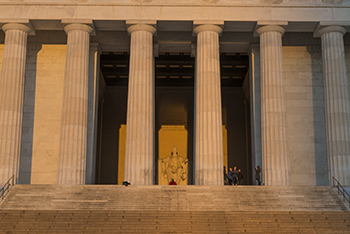 Ironic, because this was my first attempt of the solar alignment at the Lincoln Memorial. There are other examples of solar alignment in the city, some intentional and others more likely an accident. Some have disappeared as new buildings have been erected or other obstacles to the sun’s light have appeared. 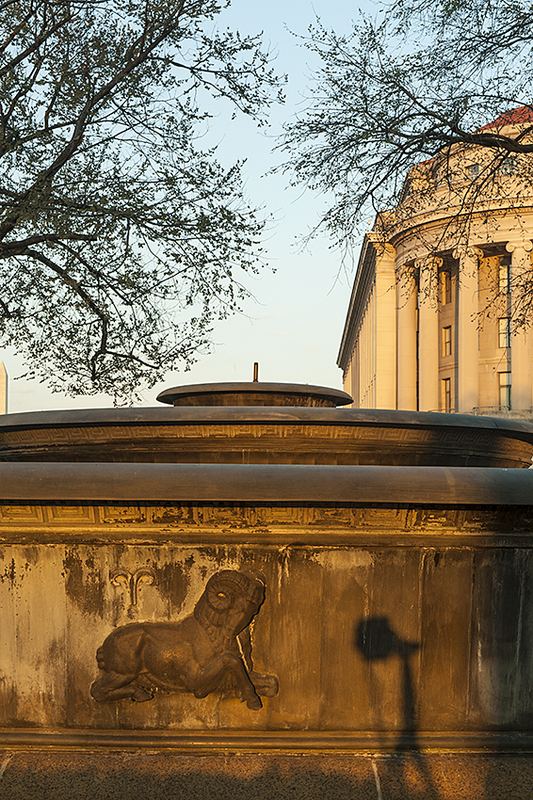 One example is the Andrew W. Mellon fountain located at the tip of the Federal Triangle where Pennsylvania Avenue and Constitution Avenue intersect. The fountain’s basin is decorated with the signs of the zodiac positioned so the sign of Aires is touched by the sunrise on the day of the vernal equinox and faces the sun from then until April 20th. (Source: James M. Goode, Washington Sculpture, Johns Hopkins University Press, page 447) Unfortunately, the effect is difficult to appreciate because the fountain has not been well maintained and the branches of the trees are increasingly obstructing the sunlight. A few minutes later, I captured the image below which was taken just on the west side of the little park where the Mellon fountain is located. Usually, you see them coming. But sometimes they come from behind and are inches from your back before you sense their presence. They carry guns, so you don’t have to be a genius to instantly realize that whatever they ask, you will do. This is the affectionate nickname local photographers have for the armed men and women wearing uniforms and badges who often appear from nowhere and always start the dialog with those three little words, “Excuse me, sir (or ma’am)…” As soon as you hear that phrase, you know there is a 80% chance that you will be packing up your tripod and moving on. Over the past 15 years as a photographer, I’ve often been interrupted by guards, park rangers, and police officers and I should say right away that I understand they have a job to do. In every case but one, they have been polite and in many cases they have shown some flexibility. Nevertheless, to improve your chances for getting the photograph you want, there are a number of ways to avoid their interference. The most obvious first step is to find out where tripods are allowed and where they are not. 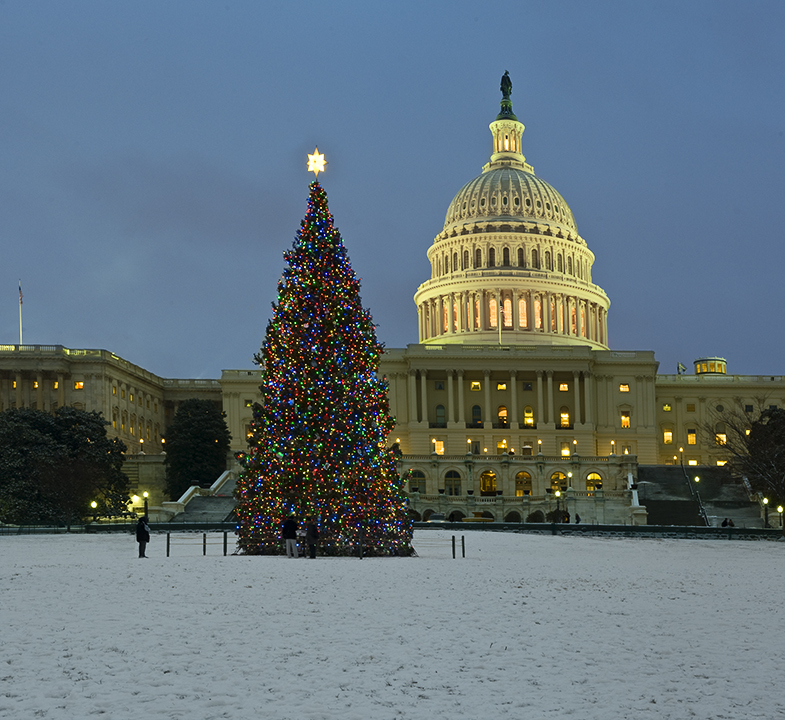 For example, the U.S. Capitol grounds are generally off limits to tripods unless you have a permit. But you can use a tripod on the sidewalk a few inches from the forbidden zone. The image above was taken shortly before sunrise on April 4, 2010 (Nikon D700, 0.8 sec. @ f/18, ISO 200). A Capitol Police officer came up to remind me that tripods were not allowed on the grounds without a permit but he was fine with my location on the sidewalk (1st Street NE). The shot below was taken deep inside the no-tripod zone, but it was 30 minutes later when there was enough light to shoot hand-held (Nikon D700, 1/160th sec. @ f/10, ISO 200). 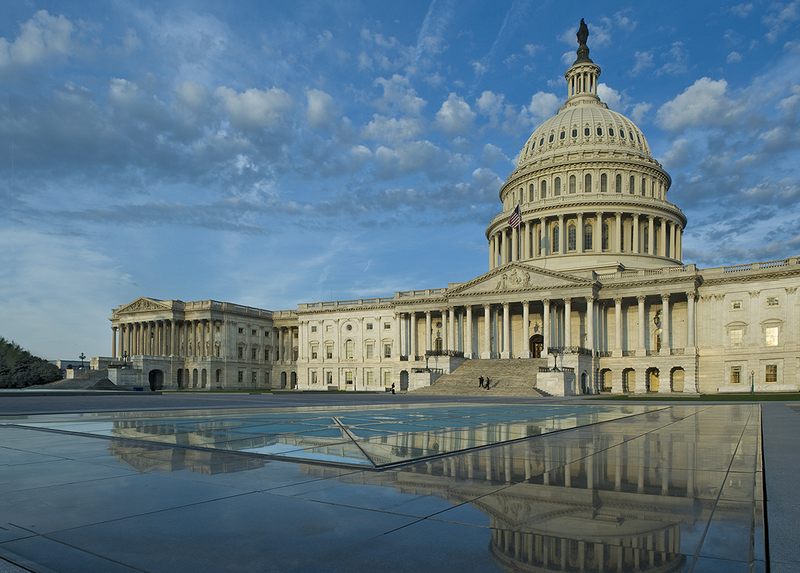 One can also get a four-day permit for photography on the U.S. Capitol Grounds (but only the grassy areas, not the sidewalks or driveways). Click here for details. Also, during the month of December when the Christmas tree has been installed, the requirement for permits is usually waived. This is quite a treat since it is difficult to tell in advance when a snowstorm will occur. Such an event happened on December 16, 2010 (Nikon D700, 1.3 sec @ f/14, ISO 400) and there was a whole gaggle of photographers out there with tripods. 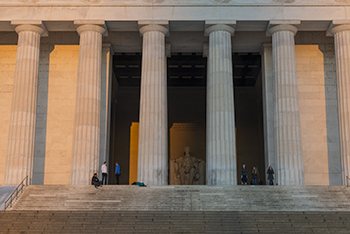 The Lincoln Memorial has a strict rule against tripods on the steps or inside. Actually, this makes sense because of the crowds and one can imagine the difficulty for tourists if every local shooter wanted to bring a tripod. But the plaza is generally OK. Moreover, there are exceptions, such as when you and the guard are the only two people there. The image below was taken on a cold morning just before sunrise in September 2012. There was no one else present, so I asked the guard if I could use my tripod (which had no metal spikes on the legs) for a few quick shots. He agreed and I set up quickly and took about five images. Sometimes you will be interrupted when you least expect it. 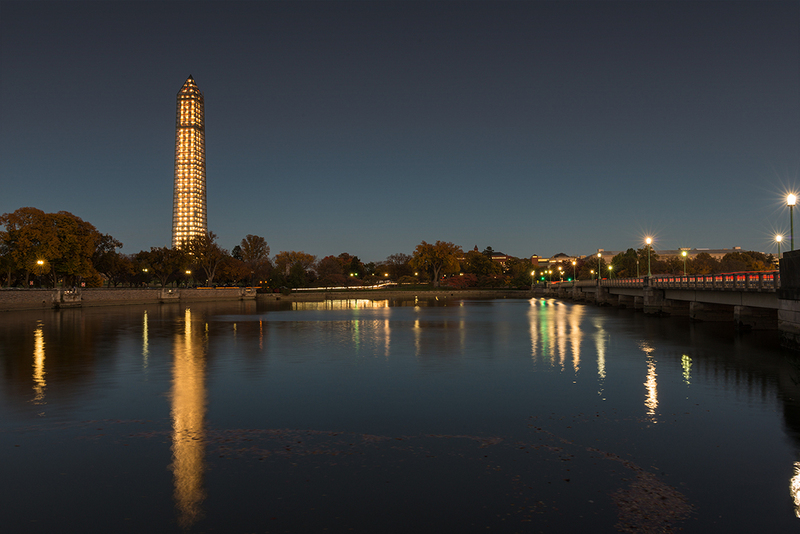 Last year, I was looking for a new angle on the Washington Monument before the scaffolding was removed and chose a spot on the edge of the Tidal Basin, just north of the Kutz Bridge (Independence Avenue). I had thought this was probably one of the least sensitive spots in the Mall area so I was not expecting to attract the attention of any security people. But sure enough, over the din of the passing cars, a voice behind me said in that unmistakable tone of authority: “Excuse me, sir. What are you doing here?” The answer seemed obvious to me—a camera on a tripod, a camera bag open next to me, etc. But I followed my own advice and played it straight: “I’m photographing the Washington Monument.” She seemed a little uncertain—not a good sign with a person who is packing a pistol. After a few questions, she told me a passerby had alerted her of a “suspicious person” and she was checking it out. What I had interpreted as uncertainty was actually a slight case of embarrassment because the officer knew exactly what I was doing. But she had to go through the procedure because I had been “reported.” After a brief interview, she allowed me to continue and wished me well. 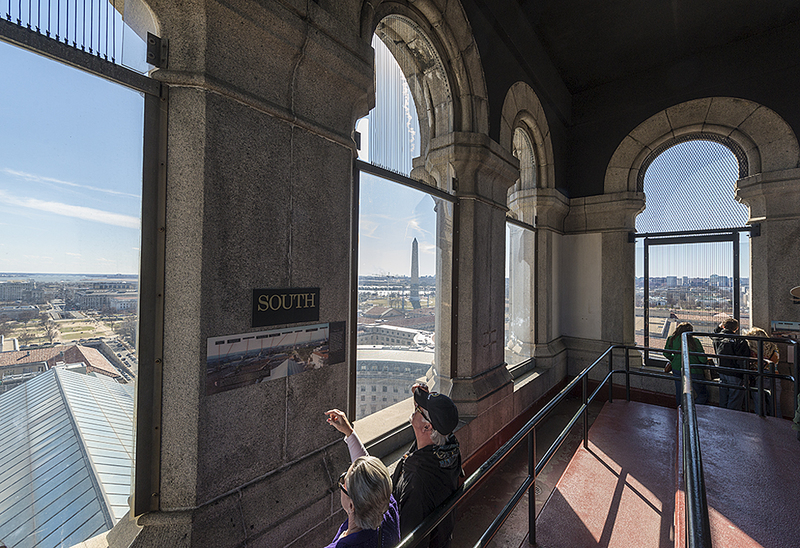 The one location where you absolutely have to play it straight is when you are taking photographs from an elevated position—such as a roof terrace—in view of the White House. 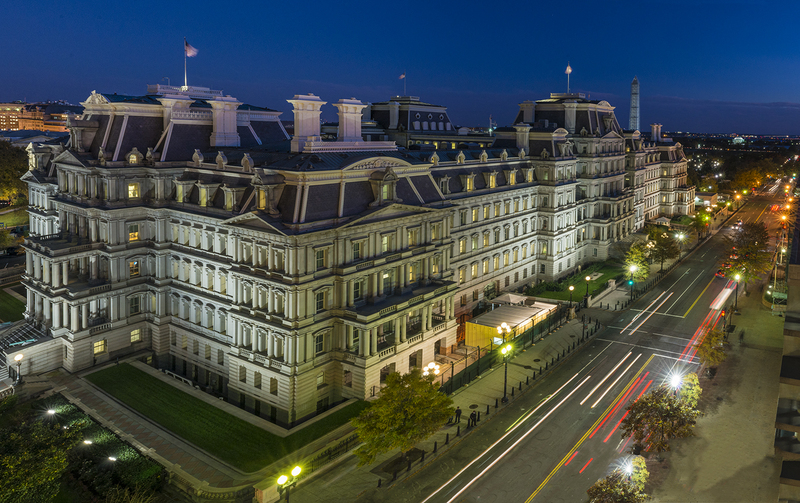 I recently was given permission to take photographs from the 9th floor terrace an office building with a fabulous view of the Executive Office Building and a partial view of the White House. 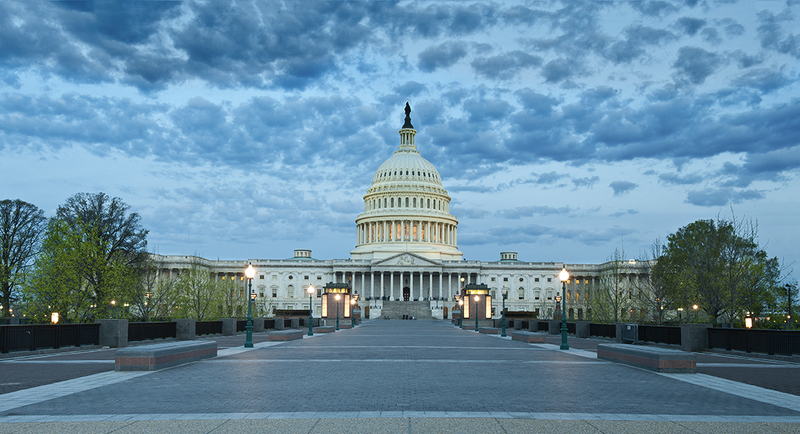 I made the mistake of assuming their permission was all I needed and with great excitement about this opportunity set up my tripod and camera overlooking Pennsylvania Avenue. It looked like there would be some excellent conditions for a sunset followed by a perfect twilight scene. I had taken a few shots and suddenly heard the all-too-familiar question coming from behind me. I turned to see three armed police officers (but their pistols were holstered) approaching me in a “spread configuration.” Behind them were two individuals in civilian clothes who turned out to be the head of building security and the property manager. One of the officers showed me his credentials and I knew this was not a tripod problem. They were Secret Service and wanted to know what I was doing on this roof. 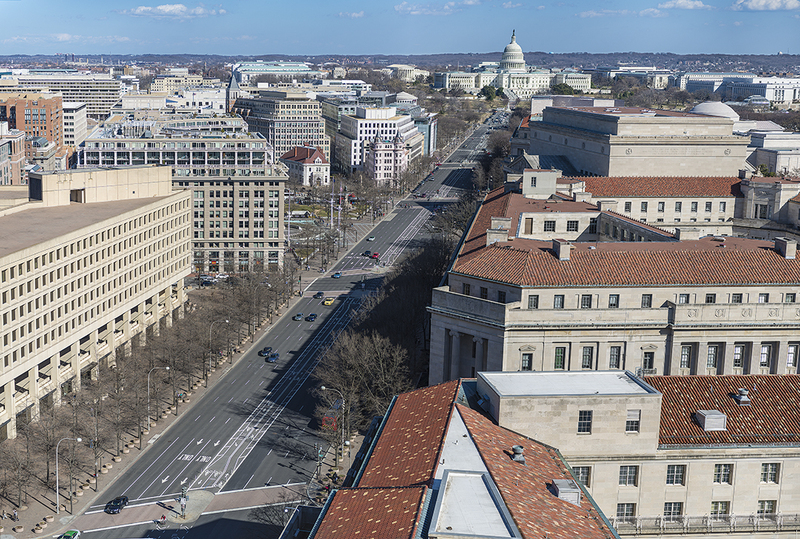 As I explained, I noticed out of the corner of my eye that three more men were observing all this from the rooftop of a building behind the Renwick Gallery on the north side of Pennsylvania Avenue. One of my interrogators asked for my identification and then walked some distance away and made a phone call apparently reading the details from my driver’s license to the person he was calling. While this was going on, the officer in charge very politely explained to me that they had no knowledge I was going to be there and that while photography is permitted, advance clearance is necessary. He added that, assuming the clearance call revealed no issue, I would be allowed to continue my photography. At this point, I had two questions running through my head: who were those guys on the roof across the street? And would the light, which was now becoming very nice, be OK if and when I was permitted to resume shooting? I never did find out the answer to the first question, except that they disappeared as soon as the clearance on my ID check came through. As for the second question, here is the image I took after I was left alone again on the roof. In retrospect, the fact that eight people were actively engaged in making sure I was just a photographer on that roof convinced me that I had better not be making casual assumptions when I get a similar opportunity in the future.